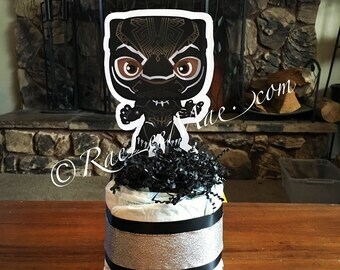 This is for 1 African American super hero diapercake mini! 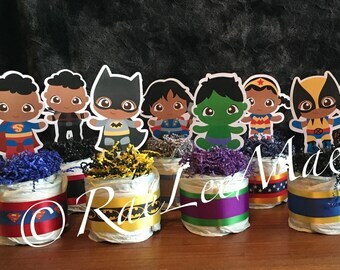 These are absolutely adorable and perfect for your super hero baby shower! If you are looking for something unique and original these are it! WHEN YOU CHECKOUT YOU MUST PUT THE DATE YOU NEED YOUR ORDER BY IN NOTES TO SELLER. PLEASE PUT A DATE PRIOR TO THE DATE OF YOUR EVENT, AS YOUR ORDER WILL ARRIVE ON OR BEFORE THE DATE YOU ENTER. IF NO DATE IS GIVEN YOUR ORDER WILL SHIP IN 4-6 WEEKS! WE CANNOT GUESS WHEN YOU NEED YOUR ITEMS SO IT IS VERY IMPORTANT TO LET US KNOW TO GUARANTEE YOUR ITEMS WILL ARRIVE ON TIME. Style choices are if you would like the diaper cake mini image single sided or doulbe sided and if you would like to add a bow. You choose which character and if you want it double sided or single sided and if you want to add a bow or not. Please let us know if you would like us to change any ribbon colors or shredded paper. These are completely customizable. Birthday decorations! 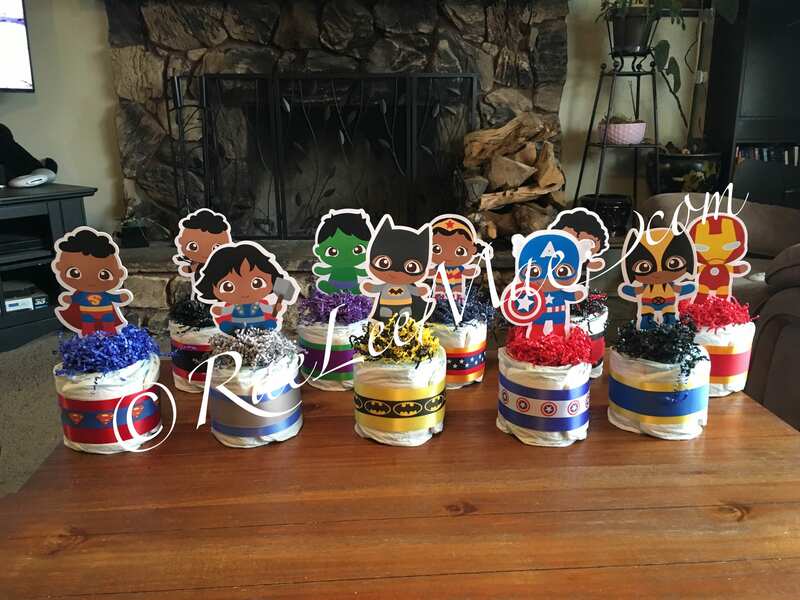 Three tier diaper cakes, banners, cupcake toppers, Centerpieces for birthdays and anything else you need can be made. Please message me for prices. Additional shipping fees may apply to Alaska and Puerto Rico. Please message me prior to purchasing for shipping quote thank you! This is an exclusive RaeLeeMae Design. You may not copy or try to re-create. All rights belong to RaeLeeMae! A special thanks to DorkyPrint for your amazing graphic designing and creating the baby characters. all character image rights belong to DorkyPrint! These images cannot be used for any monetary purposes without a prior written legal agreement from owner(s).